Invincible Iron Man really started things off right in its first issue. The story introduced us to a new version of Tony that seems to be a lot more likable of a person (for now) and is back to being a proper hero. The story introduced us to Madame Masque, who seems to be the main antagonist for now as well as a cliffhanger with a surprise appearance from an extremely different Dr. Doom. The first issue really roped me in with Tony’s personality, which plays up the fun sarcastic side and aligns him more with the MCU version. The opening start to this story had me interested; I liked the choice of Madame Masque as a first antagonist but don’t know a whole lot about the past between her and Tony. However, I think it will be good if Tony is put in a position where he has to confront his former self and anything he might have done. 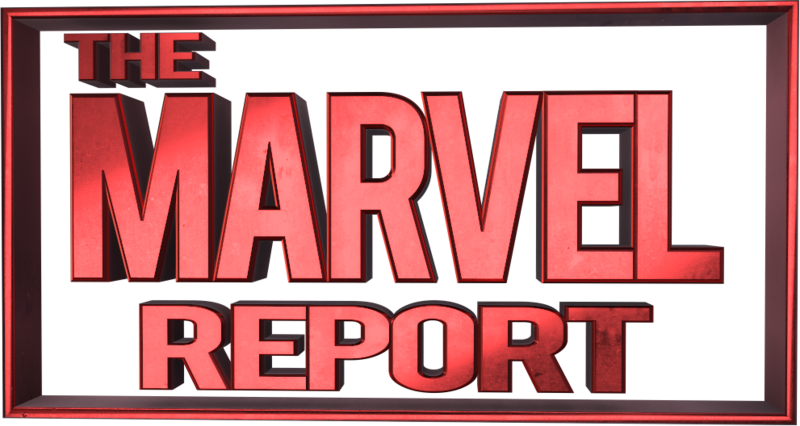 It gives us a chance to really see what this new Tony Stark is all about and whether or not he honestly means well or will fall down the same holes he has in the past. I’m not caught up with Secret Wars yet so nothing has really been spoiled for me, but a new and improved Victor Von Doom (what a rhyme) showed up at the end of issue #1. We pick up right where things left off and Tony can’t even believe it, but Friday confirms that it is really Dr. Doom. Doom is actually trying to work with Tony and earn his trust; whether that’s true or not is yet to be seen but I’m very intrigued by this new Doom. I’m fully expecting him to have some ulterior motive here but want to believe he could be different and trustworthy. I thought the Madame Masque plot dragged a little bit more than I expected it to. It was stuck as the B-plot in this issue and clearly setting up to be the next issue’s main plot. 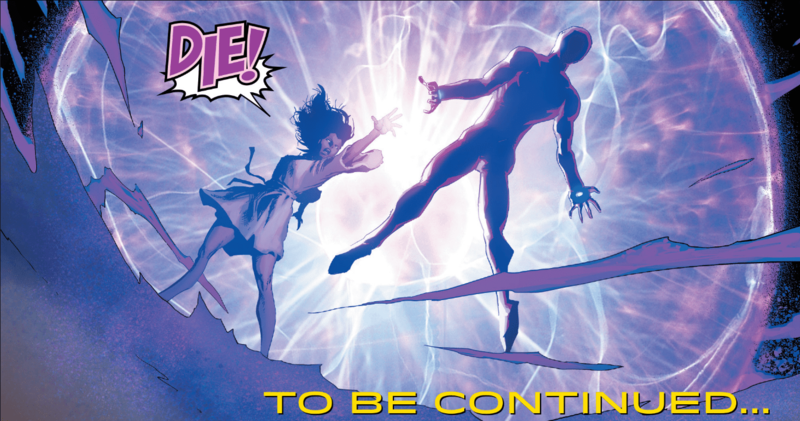 I absolutely loved the cliffhanger of her having powers and look forward to reading the follow up for that. At first, I thought she was just going to short out Tony’s suit for a little while she got away and definitely didn’t expect for her to unleash some type of force. I thought the Madame Masque introduction in this issue was a little weird at first, but then realized at the end she is clearly dealing with something that she might not have full control over yet. 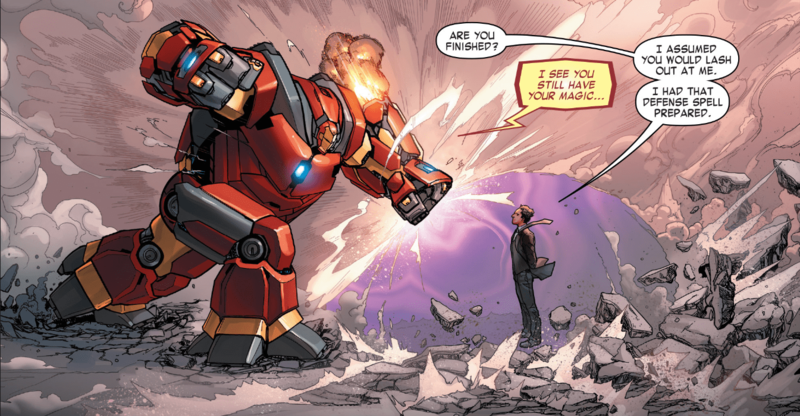 I’m really enjoying Invincible Iron Man for many reasons, but I think what carries my interest is Tony’s new personality and the new Iron Man armor. Tony is a lot more fun this way and I think it’s working out really well for his character to receive a fresh start like this. The writing is great so far and Bendis has the character’s voice down really well, especially with the jokes and remarks. As for the suit, it’s extremely fun. I love the simplistic design, but the fact that it can use any Iron Man suit form from the past is really cool. In this issue we finally got some examples where Tony used the Hulkbuster vs. Dr. Doom (above) as well as a Stealth mode against Madame Masque (left). I want to see what other cool ways Tony can be sneaky with his armor, plus it will be really great to have the armor periodically changing when necessary as the story goes along. The easiest way to sum up Invincible Iron Man is fun. The character, the story, the armor; it’s all a ton of fun to read so far and has provided an interesting introduction to the All-New All-Different post Secret Wars world. The inclusion of Dr. Doom into the story is fun and probably the most surprising thing so far, but I’m just as curious to see how the Madame Masque story plays out as well. I love seeing Tony on his own right now and think it’s good for him to interact with these characters that he normally wouldn’t cross paths with. Bendis has been really solid with the writing so far and the tone he’s created is really carrying this story well so far. So I would assume Madame Masque believes that the Wand of Watoomb can help her somehow. Marquez was on point with the artwork again this week. I don’t really have much to add about his style but he did a crazy good job with the scene that displays the stealth armor! I really love the interaction between Tony and Dr. Doom. I would love to see their relationship develop into something legitimate, but we’ll see.